CMS operates a range of marine simulation equipment that covers a broad range of marine and offshore activities. Much of the equipment is highly specialized and unique including fully motion capable simulators. The center also provides technical management and support of simulation equipment that is used by other parts of the Marine Institute. CMS simulation activities can be divided into three main areas; Training, Industrial Response, and Applied Research. To support these activities the Centre continues grow its technical capacity and as such is able to provide solutions for many of its clients including the development of ship models, geographic and area databases and the provision of software development. Reflecting its location in Newfoundland and Labrador, the centre has focused its ability on representing operations in harsh environments and ice covered waters. With training, CMS is involved in offshore oil and gas and commercial shipping. While Dynamic Positioning and Mobile Offshore Drilling Unit (MODU) Stability and Ballast Control training has felt the effects of the down turn in the oil industry globally, CMS has seen an increase in training related to support and supply vessels using the new Offshore Operations simulator. This includes Anchor Handling level 1, Anchor Handling Stability, Ship Manoeuvering with Azimuth, etc. In Commercial shipping, with focused courses like Ice Navigation, Leadership and Management training, and Bridge Resource Management remain steady in demand. With industrial response, CMS utilizes its equipment and development capacity to provide services for the offshore oil and gas and commercial shipping industry as well as port design to examine planned operations, rehearse procedures, and evaluate risk. A significant project that CMS has been involved in over the past year is the tow to field simulation for the Hebron Platform. The Hebron Platform is a gravity based structure (GBS) that will be used in offshore oil production on the Grand Banks of Newfoundland for Exxon Mobil and its partners. This project will see the 700,000 ton structure floated and towed by six vessel some 300 nautical miles to its offshore site. CMS has conducted this type of work before, notably with the Hibernia GBS, but it nonetheless is a highly challenging technical project. With research, CMS has been leading a large multi year project to develop proof of concept Dynamic Positioning capacity for hydrocarbon exploration/production operations in ice covered waters. This Joint Industry project involves tanks testing of hull models with DP systems to study the ability of the technology to identify and counteract managed ice conditions. For its part CMS is developing a specialized visualization system that will make use of ice data coming from the ice modelling tanks to simulate realistic ice-hull interaction. Much of this work will serve to improve the level of ice modelling at the centre and assist industry to carry out operations assessment with modified DP technology. 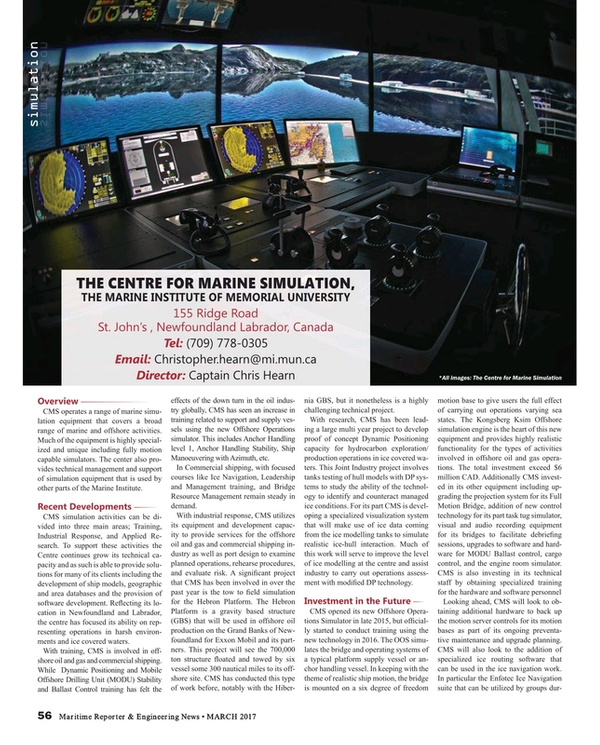 There is a thriving ocean technology cluster in St. John’s involved in the development of technology for use in marine activities and this includes research on the use of simulation in areas such as studying fatigue impact and similar human factors. CMS is an important part of this activity and often is able to improve or enhance its systems as part of these research activities. There are some fundamental aspects of maritime simulation training that will remain the same, specifically its use in providing a forum for people to demonstrate their understanding of navigational and watch keeping practices in situations they might encounter at sea. However, as simulation technology has improved, and specifically the fidelity of the physics engine and visual displays, the ability to use simulators in more specific industry applications that go beyond just training and certification is happening. The shipping and offshore industry has started to accept simulators as a valuable tool for use in analyzing situations and for being able to assist in validating a decision to undertake an operation. This can be for large port development projects analyzing the specific configuration of a quay or dock, to determining the minimum number of tugs a ship may need to get alongside. The cost of using a simulator in these situations is small in comparison to the total capital cost and it allows a means for companies to explore and demonstrate concepts. Many maritime colleges used their simulators as part of formal training; RADAR plotting, collision avoidance, passage planning and navigation, radio communications, engine control room etc. But as younger instructors have started to replace older personnel in colleges they are demanding more capacity from simulation providers in order to use simulators in other applications in maritime education that better reflect their experience in today’s industry. Simulators can be used as part of looking at how people interact with each other in complex or demanding situations that impact situational awareness or highlight the need for communications. Where do you see opportunity for growth? CMS has a history in simulation for both training and industrial projects for operations in ice. The Center recently led the International Maritime Organization (IMO) working group tasked to develop the new basic and advanced ice navigation model training courses for use as required by the Polar Code. In addition to ice navigation for commercial shipping, CMS is also looking at developing more specialized training for the offshore industry in area of ice management such as ice berg towing to protect offshore drilling units. Keeping in the area of ice, CMS recently delivered a successful training for a cruise ship operating in the Arctic. While we haven’t considered the cruise industry before, statistics indicate very little decline in that sector which may open some opportunity for the type of special simulation services we provide. From a perspective of actual maritime simulation technology, the impact of the gaming industry on the maritime simulation is not hard to miss, with the drive to increase the graphic level of visual detail. While gaming exists as a form of entertainment and isn’t governed by representing reality there are certainly areas where maritime simulation can benefit. Some gaming companies have seen market opportunity and actually developed approved marine simulation equipment that is on the market at less costs, providing increased competition. With the amount of information generated in today’s simulator systems, the possibility of big data analytics may also prove to be something that becomes part of future development. Simulators may be able to provide deeper analysis and prediction of performance which can assist the instructor in refining their teaching methods or focus more on experiential learning on an individual basis with students.